Above is the basic geometry that governs all Conic Shelters. This geometry arises in order to utilize the full 4'x4' plywood panels during construction. During readings about the Great Pyramid of Cheops I was able to compare the top angle of the Pyramid to the Conic Shelter geometry. The southern face of the Great Pyramid is shown to the left. The base originally measured about 230.33 meters square and the original height was measured at 146.59 meters. Doing the geometry for the Cheops Pyramid, the diagonal of the base is 325.74 meters which means that the top angle of the diagonal is calculated to 96.02 degrees. This is about one degree short of the top angle created by the Conic Shelter geometry. 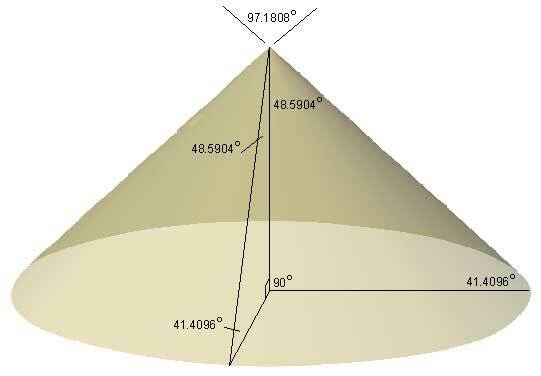 If you were to take the Great Cheops Pyramid and spin it on its axis it would trace out a cone that would have very nearly the geometry of Conic Shelters. Many have reported that the Conic Shelter form has a cathedral feeling that invites an inner calm or a feeling of tranquility. Concurrently, many have said the same about the pyramid geometry including claims that the pyramid form produces a healing, rejuvenation or energy focusing capacity. All this begs the question: Is there a connection between the Conic form and the pyramid form?